GREENWICH VILLAGE — NYU faculty opposed to the university’s massive expansion plan took a page from Occupy Wall Street Wednesday night by projecting images protesting the redevelopment project on a handful of the college’s campus buildings. Using the OWS “illuminator” — a van featuring a projector attached to the vehicle’s roof — activists lit up the sides of NYU’s Bobst Library and high-rises in Washington Square Village in an attempt to draw attention to the plan they see as out of scale. 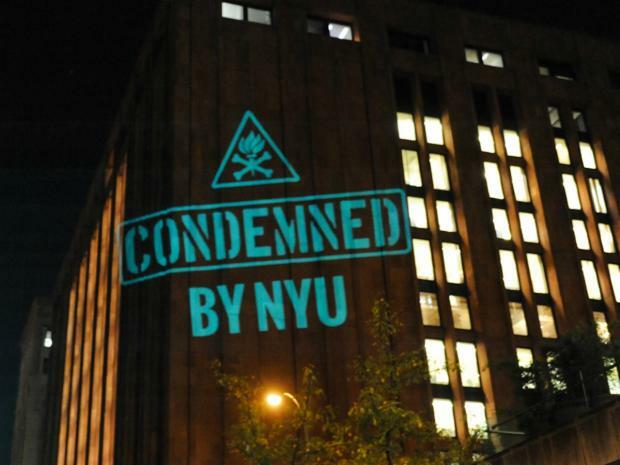 The projections included images with phrases like “Condemned by NYU,” “NYU: Too Big to Fail?” and “Hey NYU, expand minds NOT property” on buildings along high-traffic campus corridors. The action was spearheaded by NYU Faculty Against the Sexton Plan, a group of university employees who have criticized the school’s expansion and accused NYU President John Sexton of exaggerating the college’s need for more space. A scaled-back version of NYU’s original expansion plan to build on the two “superblocks” the school’s owns near Washington Square Park was approved by the City Council in July. Activists added they didn’t have any run-ins with authorities over the projections.